Senior heads of national team allegedly approved system to limit black players and those of north African origins. France has been plunged into a fresh race crisis after claims that football officials tried to limit black and Arab players on youth training schemes to make the French team more white. "For the top brass in French football, the issue is settled: there are too many blacks, too many Arabs, and not enough white players in French football," the website said. According to Mediapart, one of the most senior football federation figures wanted to set a cap of 30% on players of certain origins, but insisted at a meeting the quota should be kept quiet. At another meeting, the French national team coach Laurent Blanc allegedly backed changing youth talent selection criteria to favour players with "our culture, our history". Sources claimed Blanc cited current world champions Spain, saying: "The Spanish, they say: 'We don't have a problem. We have no blacks.'" Amid stupefaction from players, the French governmenthas asked for clarification from the football federation, which has denied setting out a quota policy. The federation's national technical director, François Blaquart, said the organisation's "only problem" was with dual national players who were trained by France and then went off to play for other countries. He said this applied to players of all races. The French team's media officer, Philippe Tournon, said Blanc "categorically denies that he could have supported selections based on ethnicity or skin colour". He added that "it goes against his philosophy" and said that Blanc was "outraged" by the allegations. 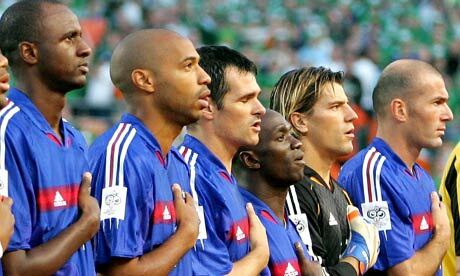 The issue hit a raw nerve in France in 1998, where their World Cup victory by a multicultural team led by Zinedine Zidane was hailed as "black, blanc, beur", and was said to symbolise a new beginning for a mixed nation, but it mainly gave way to great unease and bickering over the racial profile of "Les Bleus". Not only did the far-right Jean-Marie Le Pen complain of too many black people in the team, a leading Socialist regional head, the late Georges Frêche, was expelled from his party in 2007 for making the same observation. Crucially, the French team's mutiny at the World Cup last summer was privately blamed by some on black or Muslim players, including the French convert to Islam, Franck Ribéry. Speculation was that the team had fragmented over the lack of the football team's "national identity". Mediapart said federation officials had even challenged the morphology of black players. The website claimed Blanc had suggested that a stereotype of player, which he described as "large, strong, powerful", needed to be changed. Blanc allegedly told a meeting of senior federation figures: "And who are the large, strong, powerful? The blacks. That's the way it is. It is a current fact. God knows that in the training centres and football academies, there are lots." Counting people by race or ethnic origin – even for census purposes or for statistics research – is banned in France, a state which, in theory, is blind to race or religion. The notion of quotas is fundamentally anti-republican. Henri Guaino, Nicolas Sarkozy's special advisor, said he was "viscerally opposed to any form of quota", adding: "Setting quotas would be the end of the republic." Lilian Thuram, a World Cup hero who is outspoken on racism and once accused Sarkozy of judging people along race lines, commented on the row: "Initially I thought this was a joke. I'm so stunned I don't know what to say." He added that if the reports were true, the scandal would run and run. Zidane should headbutt them all. Well, maybe he has a point there. If there is a stereotype that black players are better athletically, then maybe it would be hard for white players to break into the team, even if there were just as good or better. After the Bhurka ban, I see the french are going all out this year.